One of the big factors of leadership is to exude inspiration so that people want to follow. 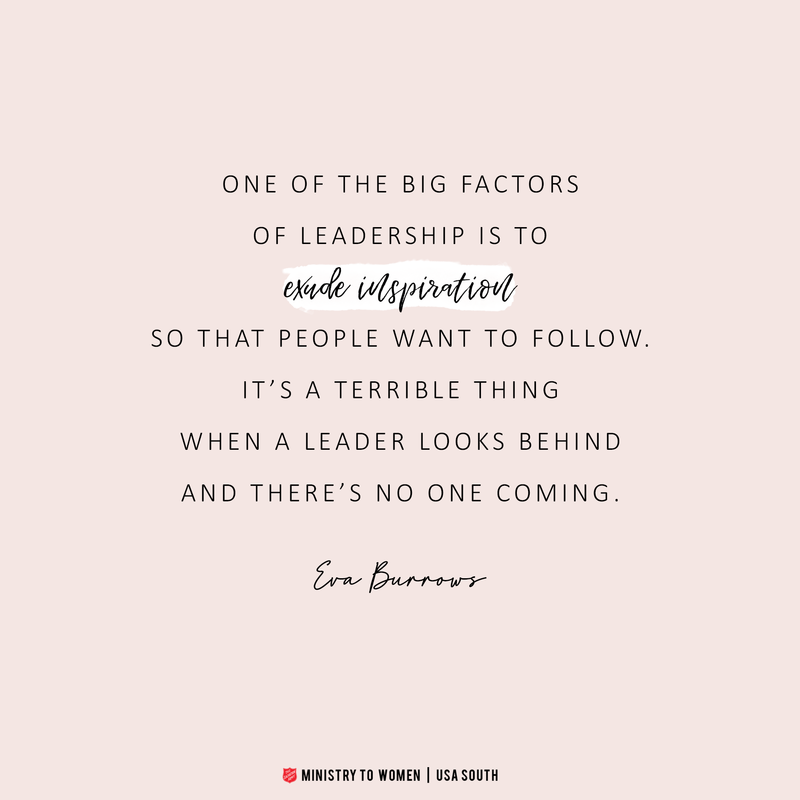 It’s a terrible thing when a leader looks behind and there’s no one coming. 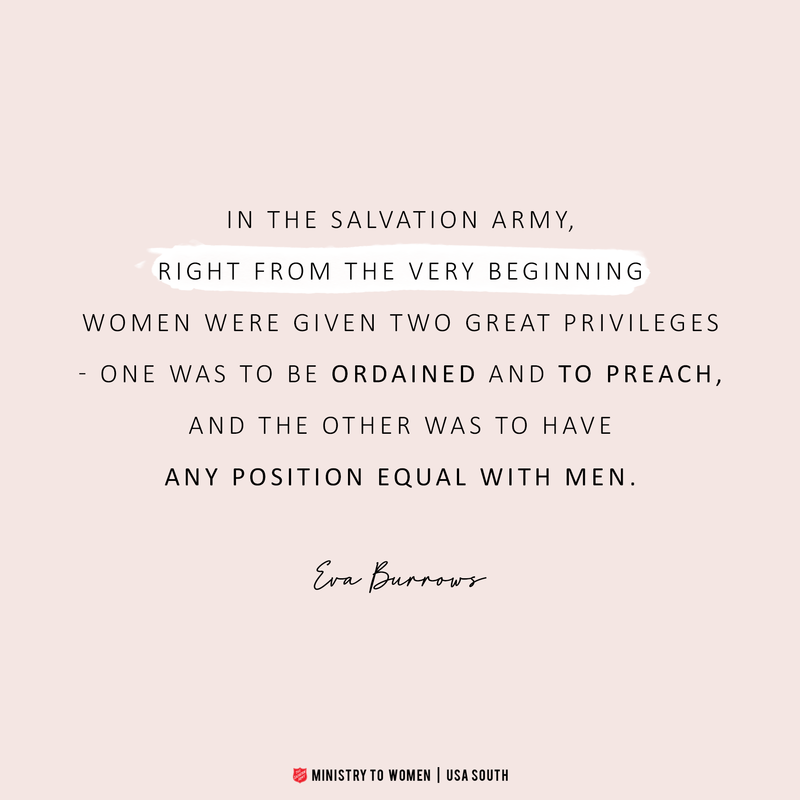 In the Salvation Army, right from the very beginning women were given two great privileges – one was to be ordained and to preach, and the other was to have any position equal with men. In family life, love is the oil that eases friction, the cement that binds us closer together, and the music that brings harmony. 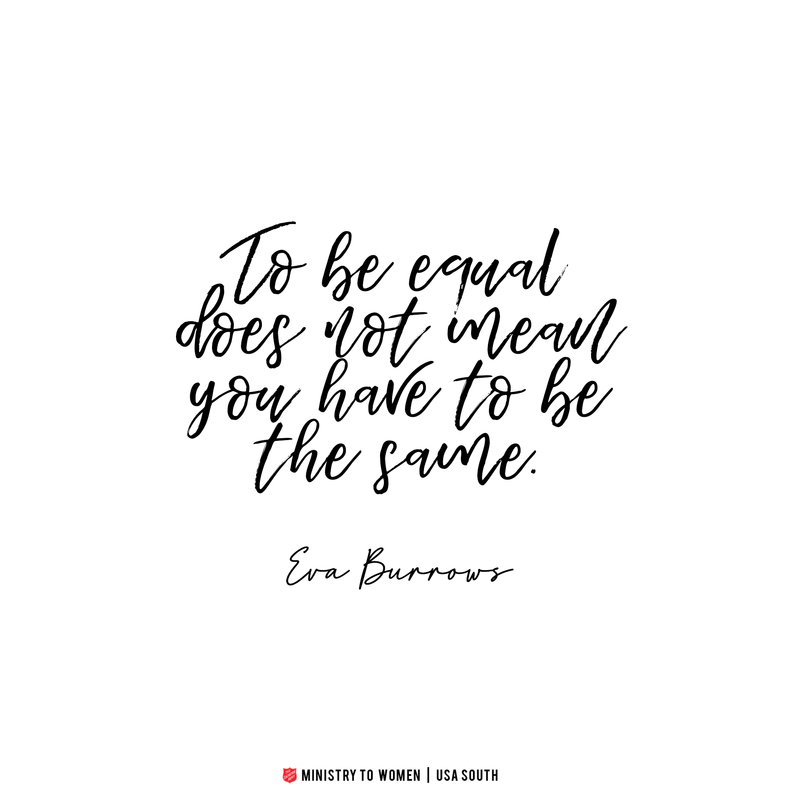 We have to be careful in this era of radical feminism, not to emphasize an equality of the sexes that leads women to imitate men to prove their equality.To be equal does not mean you have to be the same. 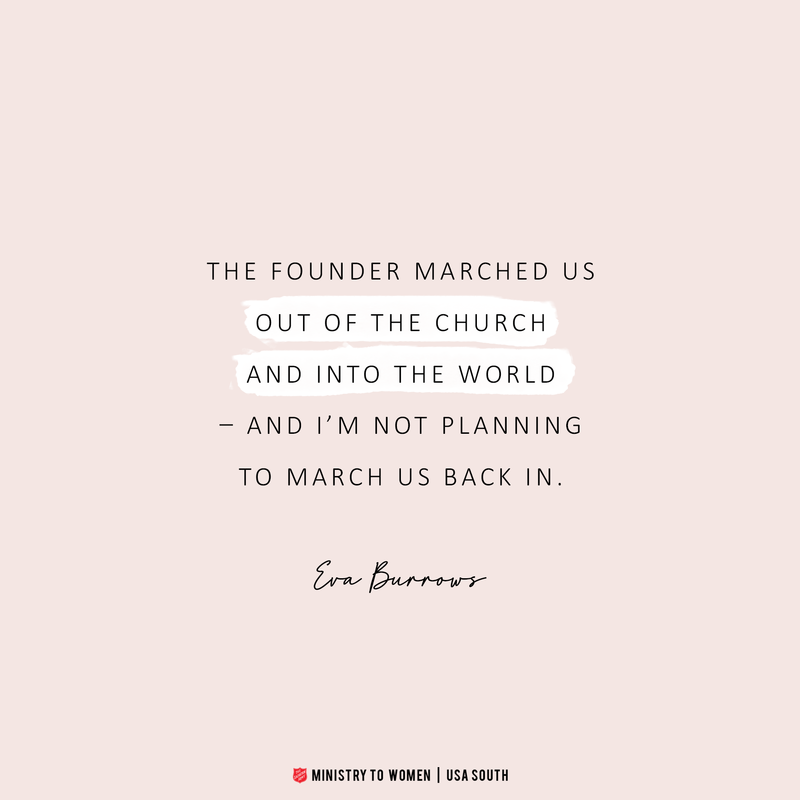 The founder marched us out of the church and into the world – and I’m not planning to march us back in. 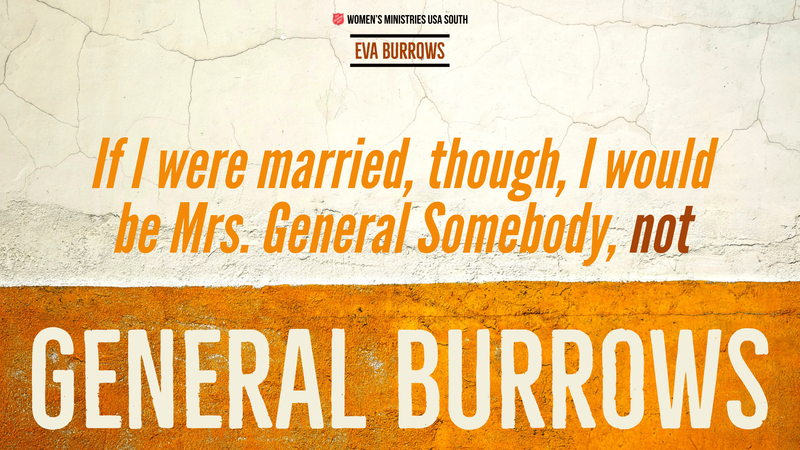 If I were married, though, I would be Mrs. General Somebody, not General Burrows. I dream of an Army that is spiritually-vibrant, Biblically-strong, culturally sensitive, evangelistically-passionate, community-concerned and Holy Spirit empowered. Such a Spirit-filled Army will be ready to sacrifice and serve in obedience to Christ’s commission, and through a strong prayer life be open to the changes the Holy Spirit is ready to initiate in our strategies for the future. Out of the blue he said, ‘What do you want on your tombstone?’ Quickly, before I even had to think, I said, ‘She pleased God’. That’s one very important thing to me; that my life has been pleasing to the God I serve. 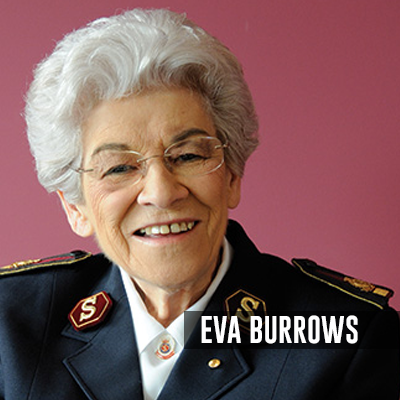 For other people, I think I would like them to think of me not as just an important leader of The Salvation Army but someone who touched their lives. Someone whose life meant something to them, either with a personal touch or having heard me preach or speak. It gives me great joy when I move around the world and somebody comes up and says, ‘Oh, General, I saw you when…’ This happens all the time. ‘I saw you when you came to such and such, on such and such a date, and you said something or other…’ I value the fact that people can remember something, whether it was a personal touch or a word. That’s really what I would be very happy about. That is why I really enjoy my work here at [Melbourne] 614, because here I’m not a very important person; they all know me and I know them, and on the whole I know their names. I’m just someone who helps them and loves them.